Kostiantyn Yelisieiev, the Ukrainian Ambassador to the EU, has provided the European Union with evidence of Russia’s support for separatists and called for tougher sanctions against Moscow, his office announced. “Russia’s actions against Ukraine prove to be an implementation of a well-planned geopolitical strategy of turning it into a ‘failed state’. The plan is based on applying innovative models of warfare – hybrid warfare and the ‘controlled chaos’ approach that are tailored to fit realities and unique features of former Soviet Union territories, the document says. introduction of Russian “peacekeeping forces” . According to Kyiv, within the 10-day ceasefire period which was declared on 30 June, the separatist fighters (which the Ukrainian side keeps calling terrorists) continued to attack the Ukrainian anti-terrorist operation (ATO) sites. Kyiv stresses that during this time, the Ukrainian side fulfilled its commitments. Nonetheless, 30 Ukrainians were killed, 79 wounded and one helicopter was shot down. According to the document, every day, armed mercenaries on military armored trucks attempt to break into Ukraine from Russian soil, bringing in BM-21 GRAD artillery rockets, mortars, IGLA MANPADS, rocket-propelled grenade launchers (RPGs), and, recently, T-64 tanks and armed personal carriers (APCs). Up to 200 Ukrainian citizens and international representatives have reportedly been kidnapped and used as human shields against the Ukrainian ATO forces. According to Kyiv, the separatists are destroying the infrastructure in eastern Ukraine. For example, on 10 June, the Kramatorsk Machine building factory was shelled, a gas pipeline in Poltava region was blown up and railway lines Ilovaysk-Kuteinikove and Ilovaysk-Mospine areas were destroyed, with freight wagons derailed in the first attack. The total number of separatist fighters is estimated at “up to 6,000”. Near Donetsk, a ‘Battalion Vostok’, an organisation called ‘Oplot’ and a so-called ‘Donetsk People’s Army’ are active, while near Luhansk the strengths are the Russia Kuban Cossac’s Army ‘Donbas Kosh’ with commander Viacheslav Mikolaiovich Petrov, the “Russian United Army of the South-East” and “Kozytsyn’s Russian Cossacs”. Photographs and details of several field commanders are included. Several photos depict Russian equipment used by the separatists, including drones and Grad rockets. Photos depict a seized Russian T-64, registered at military base No 205, Budyonovsk, Stavropolskiy Krai, Russia. A captured APC is apparently equipped with shielding used exclusively in the Russian Federation. In photos of Kamaz and Ural army trucks that crossed into Ukraine at the Dolzhanskiy border checkpoint on 23 June, the tactical symbol of Russia’s 18th infantry brigade is visible on the vehicles’ doors. 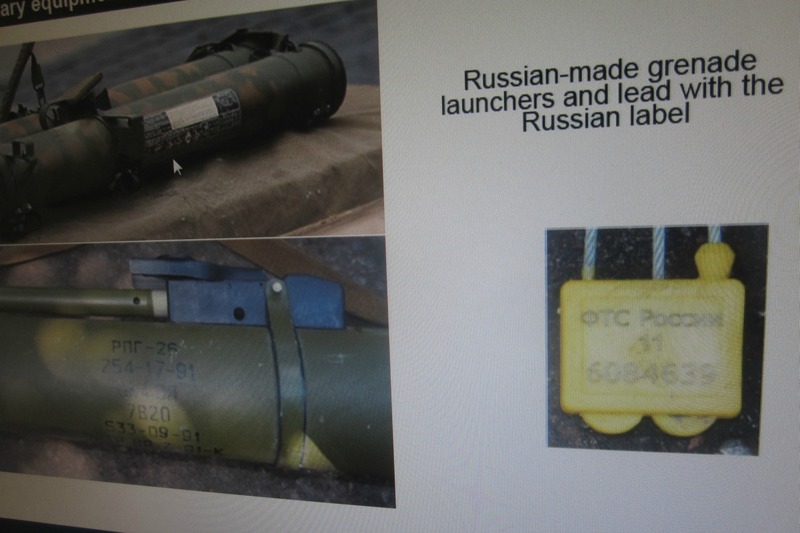 Several photos show seized mortar shells, grenade launchers and IGLA missiles, complete with Russian markings. According to the document, the Ukrainian An-26 transport, which was shot down on 14 July near Nizhnie Grachiki, was fired on from Russian territory, a photo apparently showing a Buk-type missile in pursuit, which ultimately destroyed the plane. Ukraine has no such missiles. Screenshots of websites flash Russian telephone numbers for “Centres for recruiting of volunteers” to help the “peoples’ insurgence” in Ukraine. Maps depict the shelling by Grad missiles on 12 July of the Ukrainian towns of Izvarino, Dyakovo, Zelenopilliya and Biryukovo from Russian territory, as well of mortar attacks on the Ukrainian border checkpoint Marynivka on 12 July, also from Russian territory. The documentation also contains photos of the IDs of separatist militants, which clearly show their Russian nationality. As part of the cover action, an information warfare campaign is reported against Ukraine, with reported cyberattacks at websites of the Ukrainian authorities and media, disinformation on Russia-controlled websites, network “trolling” etc. “This is the moment of truth for the EU. An expression of the solidarity with Ukraine would be consistent and logical step. Member states should put international law, common democratic values ? ?and common sense above their business and energy interests”, Yelisieiev was quoted as saying by the UNIAN agency. In the meantime, the Financial Times published the draft summit conclusions on Ukraine, which are expected to be adopted tonight. Sanctions would include cutting all new project funding for Russia, including ‘entities’ that are supporting material or financially Russia’s covert actions in Ukraine, the suspending of financing for Russia by the European Investment bank (EIB) and the European Bank for Reconstruction and Development (EBRD), as well as cutting off EU bilateral and regional aid programmes, and refraining from financing any projects that implicitly recognise Russia’s annexation of the Crimea peninsula. “The European Council notes that the engagement of the Russian Federation has not led to the illegal armed groups laying down weapons nor to the cessation of the flow of weapons and militants across the border,” EU leaders will say. Kyiv says Moscow has provoked the rebellion and allowed fighters and heavy weapons to cross the border with impunity. It has struggled to reassert control over the eastern frontier, recapturing border positions from rebels. The fighting has escalated sharply in recent days after Ukrainian President Petro Poroshenko ordered on 1 July an assault on separatists. Since, Ukrainian forces pushed the rebels out of their most heavily fortified bastion, the town of Slaviansk.